It's Monday, my daughter is out of school today, and we were up half of the night listening to the tornado warnings, rain, and heavy winds billowing around my house. To say that I needed some cheering up this morning would be nothing short of an understatement. So, after my morning cup of coffee and some Sudafed to unclog my head I was gearing up with this cheery cherry surprise! Pie is one of my many achilles heels. And if it's cherry pie? I'm even more of a sucker! There's little to me that's more comforting to me (food wise) other than a nice slice of homemade cherry pie. However, since we were in the early morning hours, I thought I might not want to dive straight into an actual pie. Instead I opted for something a little more breakfast/brunch style. Yum! 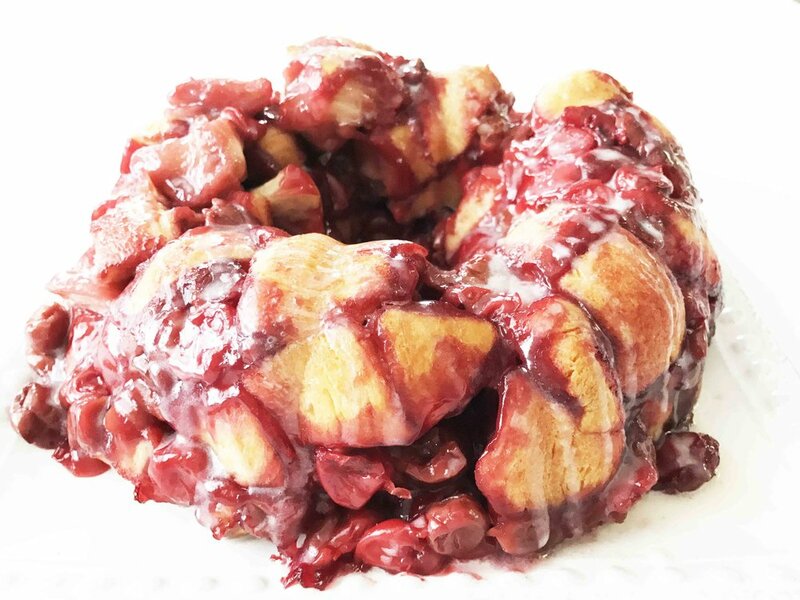 Okay, so this Skinny Cherry Pie Monkey Bread is exactly what I needed to get the lift I was looking for this morning. The idea for this monkey bread came from another I ran across, but of course I'm all about lightening things up as best I can. To lighten this bad boy up I started out with some wheat biscuit dough, because if I'm going to have bread or dough of any kind I want to get as much nutrients from it as I can. I also used a light pie filling and beefed that up with some pitted whole cherries that were packed in water. I also halved the sugar and used a brown sugar/natural sweetener blend. It doesn't stop there! The amount of glaze is also halved, because I didn't find that this monkey bread needed any more sweetness than that. Plus, even halved it's quite a fair amount of glaze. 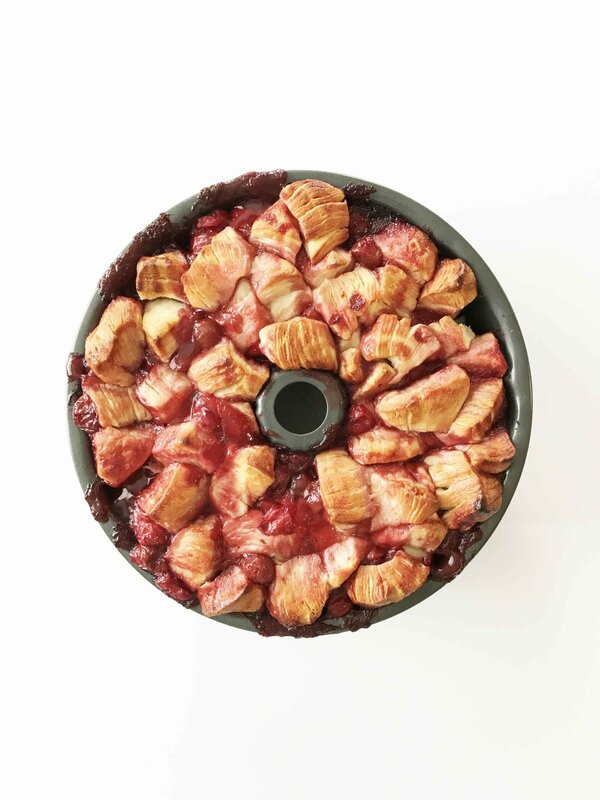 This recipe makes for a rather large bundt pan full of cherry pie monkey bread goodness. It will feed a crowd, that's for sure. I think I'll be eating cherry pie monkey bread for the next week to get it all gone. You don't see me complaining about that though. 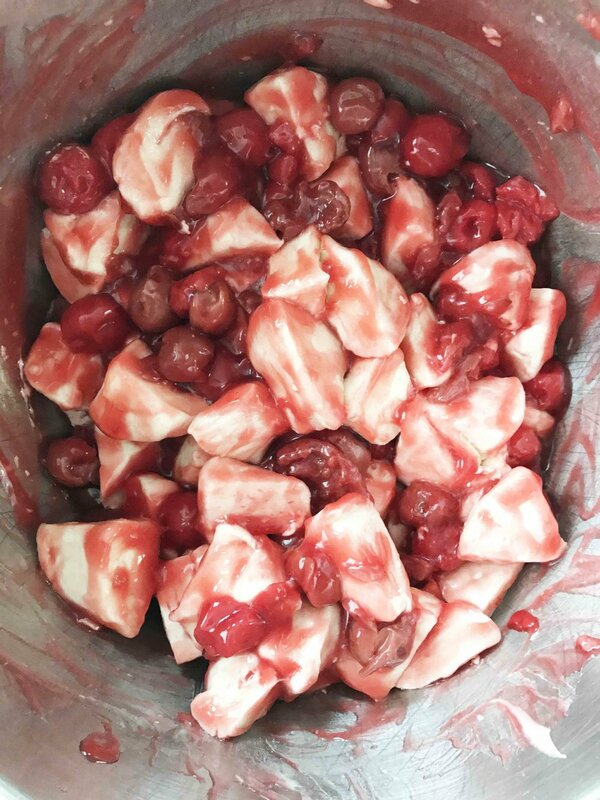 Honestly you could make this same thing with just about any flavor of fruit pie filling, so feel free to go nuts and shake things up with cherry isn't your jam. In a large bow, mix together the 1 (20 Oz.) Can Light Cherry Pie Filling, 1 (14.5 Oz.) 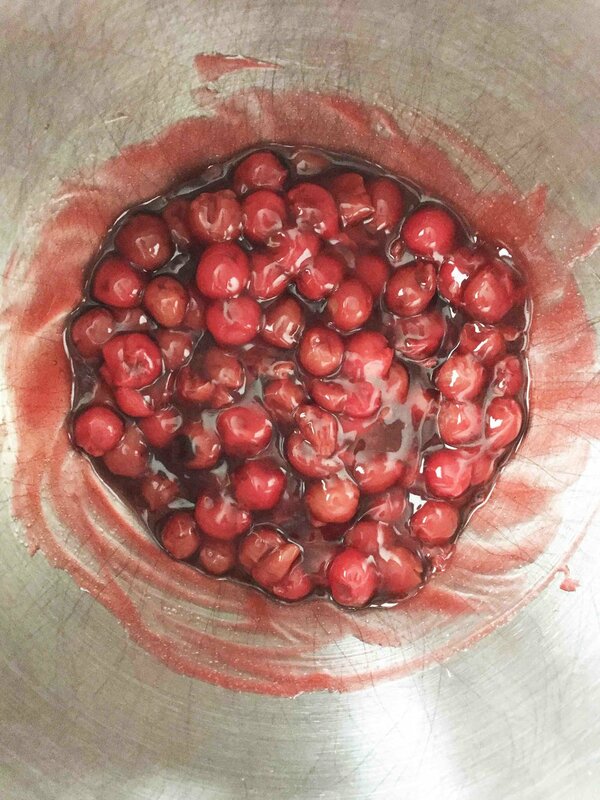 Can Whole Pitted Cherries, 2 Tbsp. Brown Sugar & Sweetener Blend, 2 Tbsp. 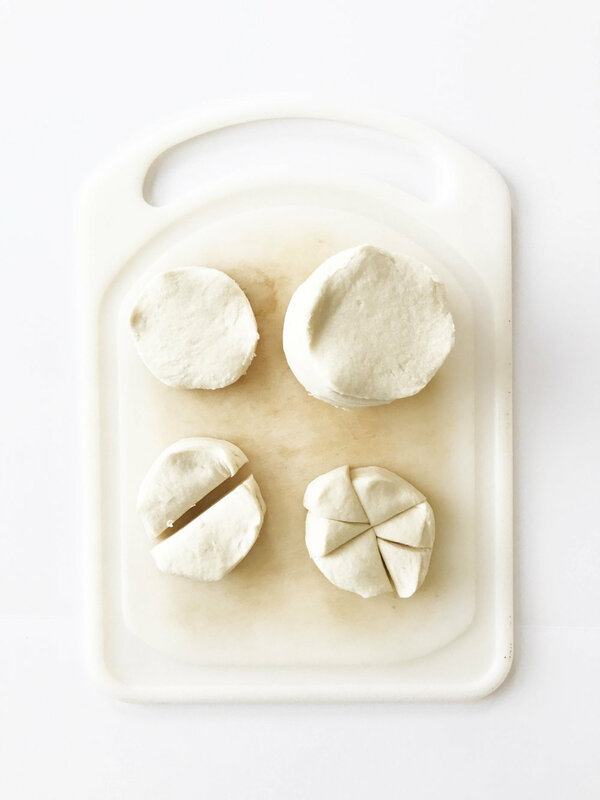 Light Butter, 1 Tbsp. Sugar, 1 Tbsp. Natural Sweetener and 1 Tsp. Vanilla Extract. 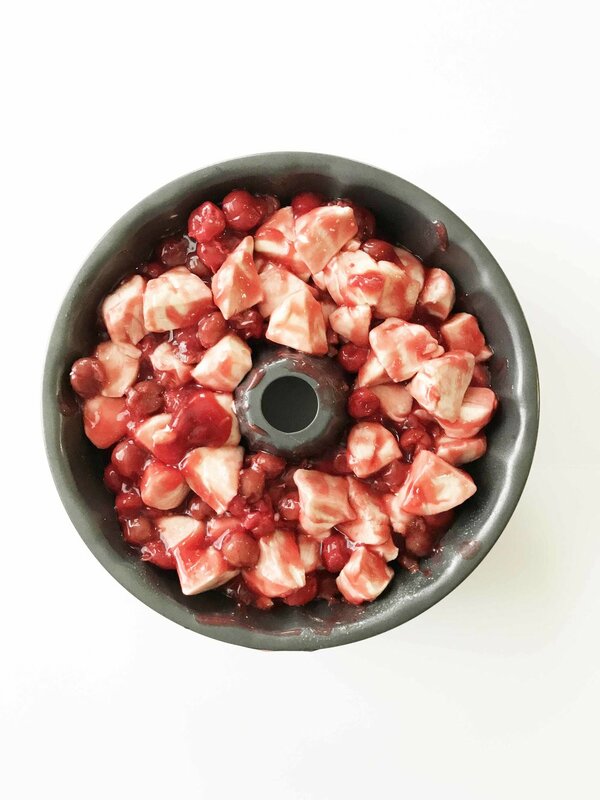 Stir the biscuit pieces into the cherry mixture to evenly coat it all. Pour the cherry coated biscuit dough into the prepared bundt pan and place it into the oven to bake for 45-50 minutes or until the dough is all cooked through. While it's cooling, mix up the 1/2 C. Powdered Sugar, 1/4 Tsp. Vanilla Extract, and 2 Tbsp. of Fat Free Milk together to make the glaze.